SNS #28 brings you – dressers! Welcome to Saturday Nite Special #28! 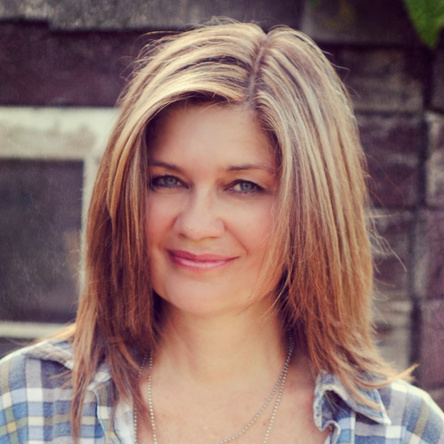 Remember when I told you about my big junkin’ day awhile back? I found this old vintage dresser among my treasures and had to have it. Why? Quite simply because the features and patina were amazing! Look at the layers of trim in this one corner! And TRY and crackle a finish like this! I fell instantly in love. And just take a look at the hardware. Why the handles were all different is beyond me! But my goodness… could it have been any more made for the way I personally decorate?!? 🙂 Aren’t they amazing? But a dresser is only a dresser if it’s just a dresser. So I had an idea. If you’ve been following me long enough, you know I love to mix oddities together for an interesting look. … then added some ivory paint on the rust, to further mimic the fading original white patchy paint patina. Using ivory acrylic craft paint, I dabbed it on quite dry with a stencil brush. I wanted abit of lightness to tie in with the dresser. Juuuust right! And below is how I used it. Tadaaa! The headboard offers extra interest to this dresser, creating a unique frame around the mismatched mirror. I love how the rusty tones of the headboard tie in with the dresser hardware and mirror frame. The top of the dresser got a clear coat (from a spray can) which brought out the original oak tone through the crackled paint surface. I love the two toned effect it has, that was achieved with no effort! The white pillowcase on the left is from my mom’s stash. This lovely teapot was my mom’s wedding gift, which now offers the perfect setting for fresh flowers. The ‘torn lampshade’ tutorial is HERE. Let me know in comments what you think on that ever changing EXTRA themed linkup idea! Let’s give it a whirl this weekend and see what happens. 5. Please link projects up that are new to SNS and within 1 month old. (*the NEW 3rd themed link can be an older post) If you can’t decide which category to enter yours in, please just pick ONE and go with it. It’s all good! That dresser is just awesome! And I love how you used your Mom’s things on it. Perfect! Beautiful dresser Donna! Love all the different textures and all the memories, too! oh my! 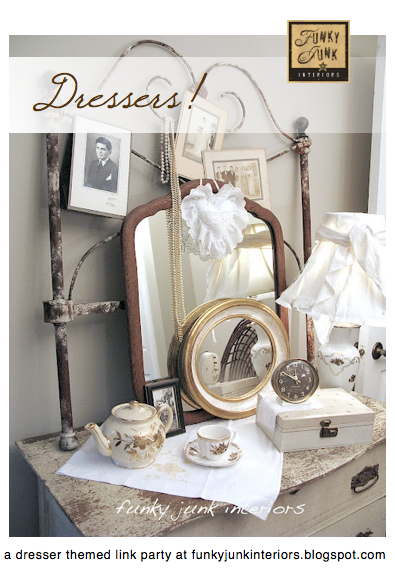 I love everything about the dresser and ALL of the sentimental favorites! It’s absolutely beautiful! thanks for the themed party! I didn’t have anything to link this week, because I didn’t post any projects! I look forward to checking out all the links this rainy, rainy weekend! ps have a good weekend. Unique and yummy as usual! What a great find, mix-matched handles? Definitely a treasure – and now one to be cherished – you’re awesome! Beautiful!! All of it, perfect together!! Thanks for hosting your party. I love everything you do, you make it look so simple! LOVE that dresser! I think the mirror in my girls room is that same style. now I’m thinking I need a rusty frame behind it. What a fabalous idea! Your arrangements are always so beautiful to look at! i just commented on inspired by post – thinking it was for SNS post. ok. once again your dresser is FAB! the way the finish is with the chipped paint – you couldn’t ask for it to be better. love the idea of the different drawer pulls. Donna…you are amazing! It looks fabulous!!! I love how you have such an eye for putting things together 🙂 Thanks for inspiring me once again! And the other links?!? My poor sidebar will start charging me a fee for overuse if I don’t slow down on all your wonderful features! Goodness… too fun! Such a FAB dresser, made even more fun and quirky with the miss-matched handles. And each of the handles are so lovely, aren’t they?! You really have a wonderful eye for styling too Donna… the way you’ve displayed the dresser top is lovely!! I particularly like that you have special “Mom” items displayed so that you can love and touch them every day! 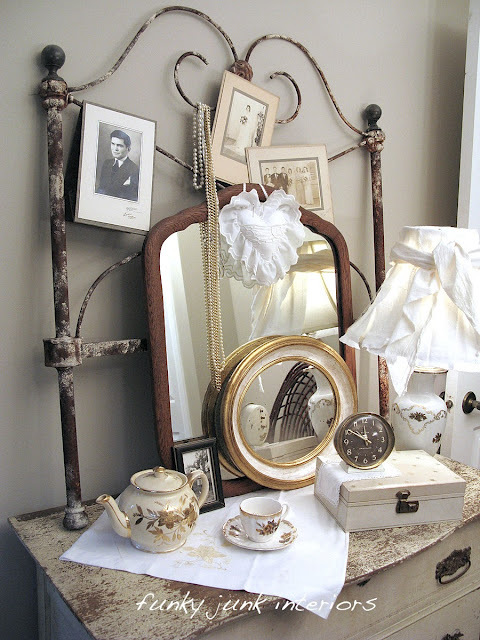 Love your dresser vignette! Too cute how you used your mama’s stuff. I do that to. The dresser is awesome, but it’s perfect with the gate on top. You always have the most incredible ideas. I have that EXACT same teapot except mine was a 50th wedding anniversary present to my grandparents back in about 1967 or 68. I am 53 and I think I was in about 5th or 6th grade. VERY COOL! I love that dresser. The crackling is amazing. But to finish it off with that rusty old frame. Daring I must say, but you make it work. What am I saying you make it ROCK! Now I must go and search for an old rusty fence. Love the new idea about the themed Linky. I have had lamps on my mind for some time now. Good motivation to get started on that. LOVE the chippy white dresser! LOVE the metal piece on top! All of these links are awesome. I have so been enjoying visiting them. Love the typekeys board. That is so cool! I also loved the dresser in greens’ and pinks’. So many wonderful DIY projects…so little time! Hi Donna! I LOVE that dresser and then you go and add a gate I almost started tearing up! It looks so AWESOME!! I have an old dresser now I’m gonna be on the lookout for a gate. Thanks for great inspiration ALWAYS and for hosting a wonderful. I love making new friends and sharing our ideas. Be Blessed! Love the dresser! And especially love the way you’ve accessorized it. I struggle in that area, so it’s Very helpful seeing you put it all together. As for SNS — I also like the idea of a themed party, so I think your addition of a third, themed category is the perfect solution. Another great idea! Love how you combined all these different elements. I love you turn trash into beautiful treasures! You have a special touch and a great eye. Have a great weekend! Your dresser turned out beautifully. I love the mix-n-match hardware. It really works on this piece. Your use of the headboard to add some height was genius. Okay I have the same..gate..mine was originally a headboard. There is also a footboard that goes with it. The were for daybeds in the 20’s..put out on porches for resting. I thought I would throw in a little history for you..lol I do love what you have done with it. I have been racking my brain what to use it for.It was my Great-grandmas..and I’m in my 50’s..so it is old!!! Donna, Once again you blew me away with your knack for putting unusual items together to make a perfect piece! This is simply beautiful, and I’m so glad you added your Mom’s momentos to it to make it even more special. I’m off to see if I already posted my dresser re-do on a previous week. I have a feeling I did…darn it! Would have loved to link to your dresser themed party. I love the themed link idea! 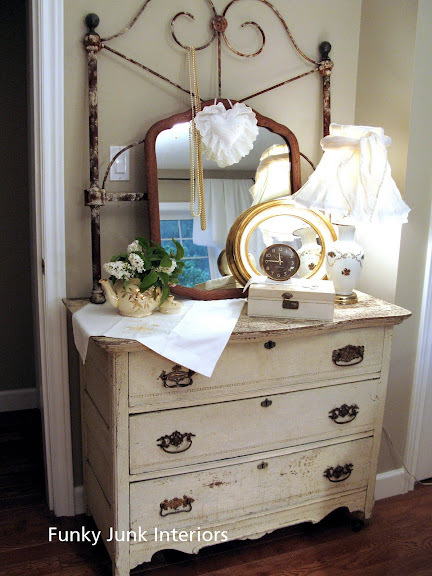 LOVE that dresser – darn girl you got very lucky and love how you put it all together. This looks wonderful! I am thinking that I need to do more garbage picking! Love that dresser. I have an old one, not as fabulous as that one though, that I need to do something with. I don’t think that I can stain it cause it is veneered. My dad’s wife swears that it is solid wood. I have done absolutely nothing with it cause I am not sure what I want to do with it yet. I think the vignette with your mom’s things on it is a beautiful tribute to her. You need a little pic of her tucked in there somewhere. Love the theme link party. 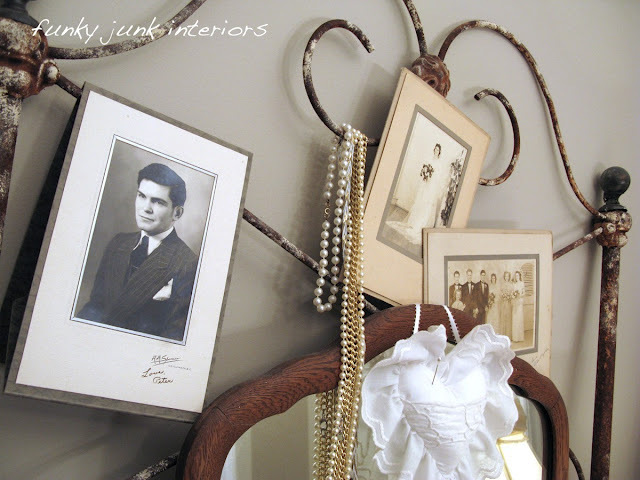 I haven’t been blogging long but I actually have a dresser post! yay! I can’t tell you how much I love your blog and ideas. I see things I like and pass them up because I have no idea what to do with them. Then I see the coolest idea on your blog and wish I had the item I passed up. You’re ideas are amazing and have made me look at things with a much different perspective. Thank you!!! 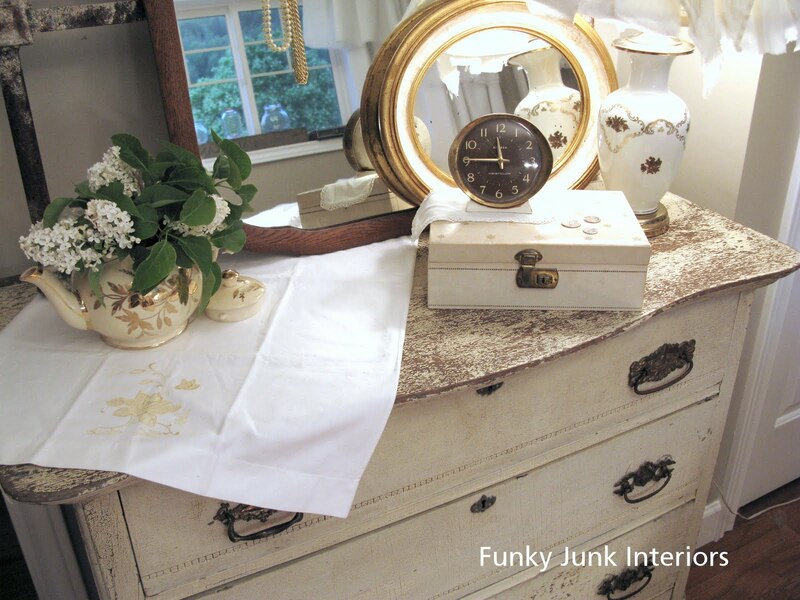 I love that dresser and, as usual, you brought it up a notch with your funky junky style. How unusual to see all the different handles. 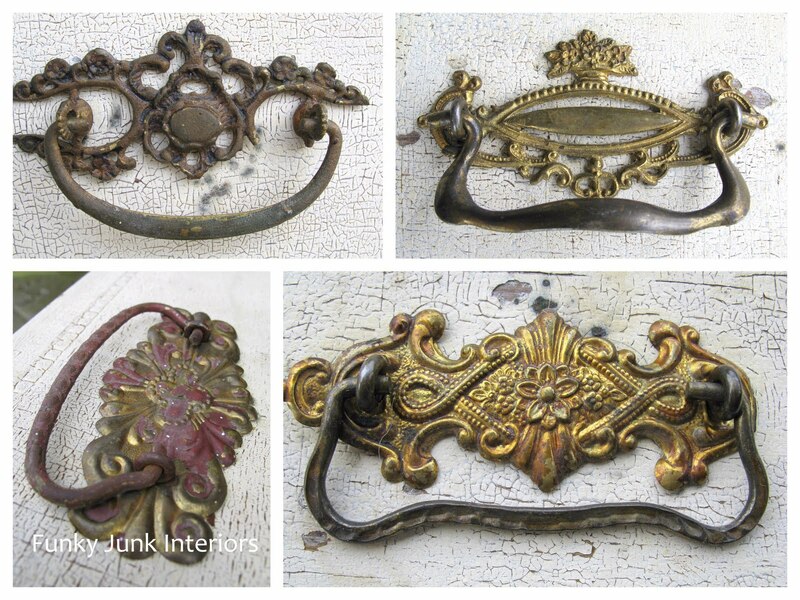 I know what I’m doing tonight … checking out all these fabulous links here. Thank you again for hosting my favourite linky party of the week. Love how you tweaked the dresser! I’m sorry to say I do not have anything new for your site only this week, so will not be able to play. All my energy is going into the store right now. Your dresser/gate turned out great. 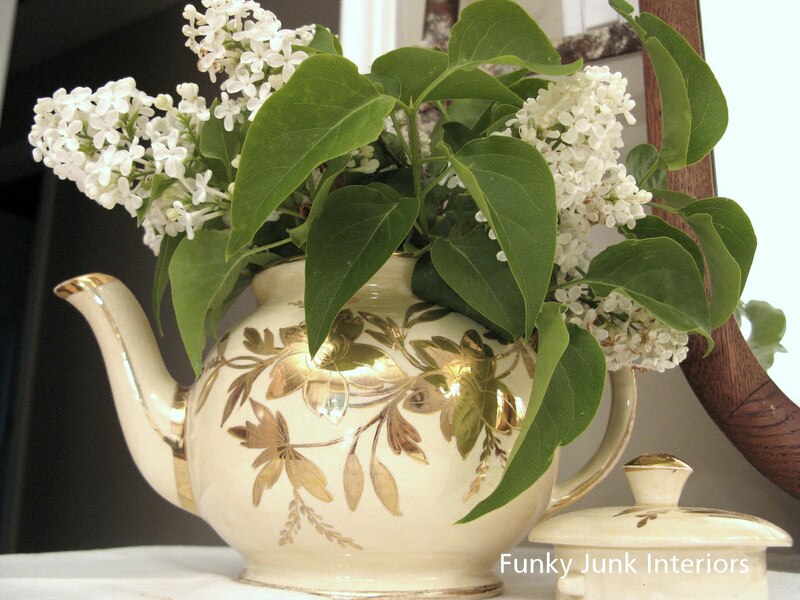 I love the fact that you were able to use your Mom’s teapot and jewelry box! I found a dresser post that wasn’t linked to your SNS party yet, one my pal Gail had posted on her blog ‘my repurposed life’. So I went ahead and joined the fun. Thanks for hosting such a great party! Aw..you guys are much too kind. I LOVE the idea of a little pic of my mom in the mix and I have the perfect one! It’s still hidden in a box somewhere so it’s time to go diggin’. And I messed up something. That isn’t a gate up above. It’s a headboard. Doh!! I’m going to go change my wording in my post. Sorry about the deleted comment — too many spelling mistakes! Anyway, as I was saying… As I started reading this post I was hoping you would leave the dresser “as is.” Thankfully you did! I should have know. Oh my gosh, it is gorgeous! 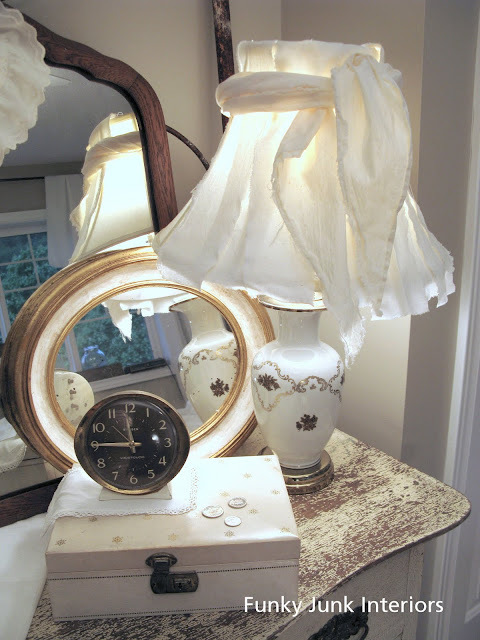 I also love the headboard framing the mirror and all the other beautiful mementos on the dresser! So meaningful and beautiful! What a perfect dresser for you!! Love it! The patina, the mixmatched hardware… Couldn’t have created a more fitting one for Funky Junk Donna if I tried. The headboard and mirror are just the cherry on the cake. This is just so beautiful. I love how you put things together to make them look perfect for each other. Your style is just amazing. 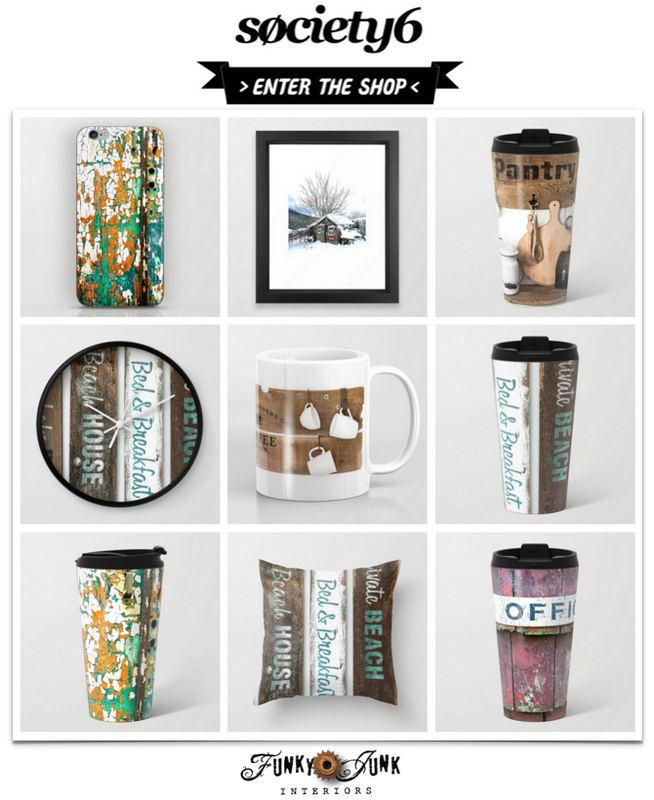 Thanks for hosting – and thanks for having the different categories! I love that! Donna, Thanks so much for putting all the SNS’ together each week. I know it’s a lot of work, but we are all so inspired by your projects and those you feature here. I hope to be able to link up in the future, but in the meantime, THANK YOU!!!! The dresser looks sooooo goood! Luv that old headboard and how you used it! Thanks for hosting such a FUN PAR-TAY! I love this party so much. So, so, so much! And I adore the themed link!! !Makes my eyes happy just looking at all those dressers! And let’s just say something fancy about those different handles on the dresser that you found that way!!!! Was that supposed to be yours, or what??? It looks amazing! And it expresses the loveliness of your mom – the sweet dainties scattered about. It’s so touching. And such an honor to her. The lamp shade was jumping out at me I have to say. So I’m looking forward to seeing what that’s all about! I can’t wait to hop around right now and visit everyone! Hello Donna, I just found your “Saturday Night Special” tonight and wanted to join in the fun. I love your blog and really appreciate that you are hosting such an exciting evening. I love what you did with your dresser, I’ve always loved the miss-matched look, and it reminds me of grandma’s home. I hope you have a wonderful week. Oh my gosh, how many times did I use the word “love”? Great dresser and great way to display some of your mom’s treasures! Donna ! You have done it again! Thanks for sharing your work with us and I love love love the categories and pictures in the party sharing…so much easier to browse now! That chippy paint is just toooo yummy. Stunning! Love the headboard idea. Your painting technique on that is way too cool! 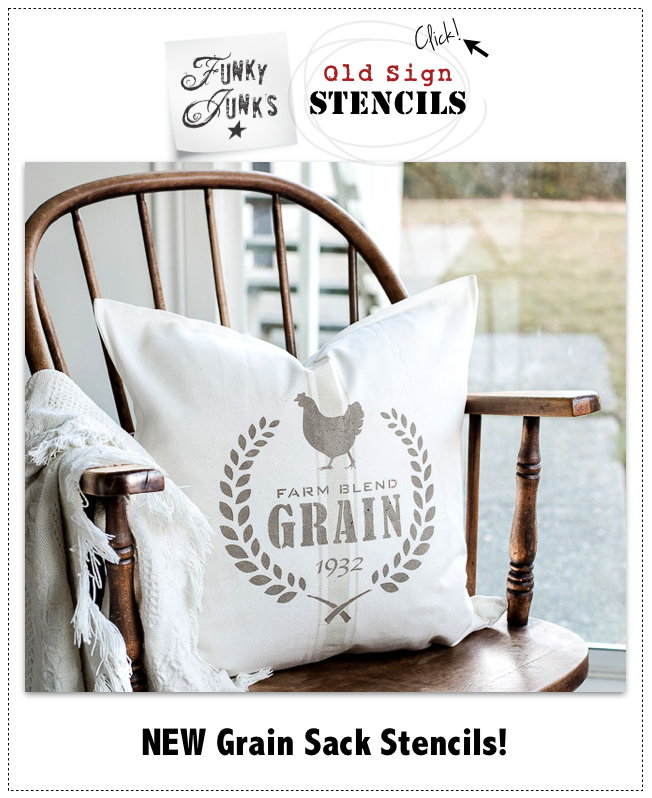 Love the sentimental touches … simply lovely! Thanks so much for hosting – Hope you are enjoying your week! That crackle is to die for!